The fourth edition of Surviving Inside Congress, the Congressional Institute’s guide to working on Capitol Hill, arrived today. Congressional offices, be on the lookout for a delivery later this week. There are few comprehensive training programs and no curriculum that adequately teaches would-be staffers how to work on the Hill. Surviving Inside Congress attempts to remedy the dearth of reference materials for staff. The book highlights the most important issues and topics they will encounter, including the hierarchy in personal and committee offices, legislative procedure, communications, ethics, and working with the private sector. This new edition provides important context for the current political landscape. It addresses many events that have occurred since the third publication: the 2014 elections, filibuster reform in the Senate, the government shutdown of 2013, Executive orders, and others. Additionally, it includes recent developments in communications, especially in the field of new media and technology. Perhaps most importantly, it contains a new chapter explaining the intricacies of the budget process. 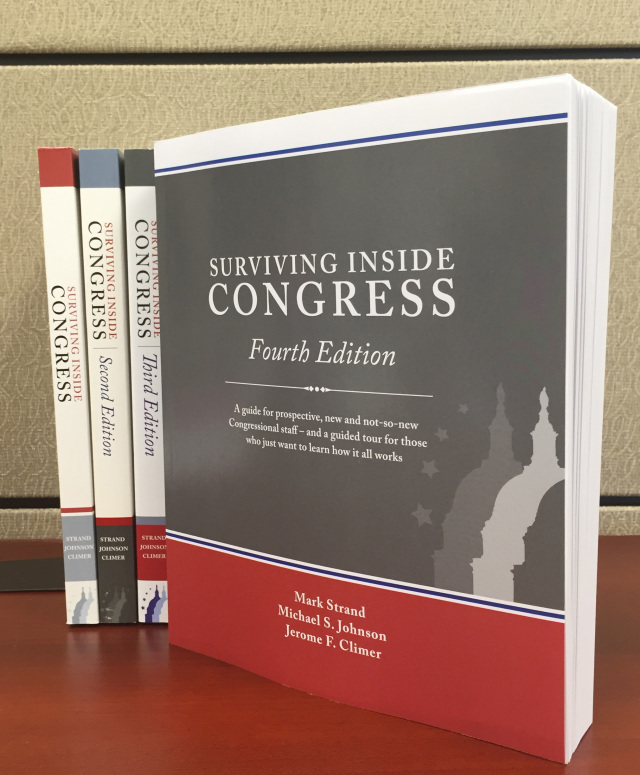 Every Member and committee office will receive five complimentary copies of Surviving Inside Congress. Staff members who do not receive a book from this shipment may request one by emailing book@conginst.org. Staff should include their name, title, office, and address in the email. The book will be delivered at no cost to the staff member or congressional office.